Smart jewelry "Innovator". Smart Hoop "Innovator". The author of the idea of smart jewelry and platform "Innovator" in today's presentation continues promoting the theme of smart jewelry. Already exists in the development of the Hoop with a video camera. Smart Hoop "Innovator" has a lot more functionality, as will be presented below. First and foremost, this smart decoration. And because smart Hoop has the ability to change its color and display certain information on its front surface, which consists of a flexible touch panel of the appropriate size. All of these functions corrects and controls the eponymous mobile app via Your gadget through the standard pairing. Further, revealing the smart Hoop, not stop at him embedded in speakers and microphone, which gives the opportunity work on the principle of bluetooth-headset with the ability of the vibration function of incoming calls. The answer or reset the incoming call can be made by a nod of the head forward or backward, making it easier to use this device while driving or in other complex situations where hands are busy with other actions. Speaker app tells who is calling, and then the user decides to reject or answer the incoming call. Smart Hoop will also use the functions of medical purpose, when its potential is the measurement of heart rate and intracranial pressure. This will allow the user of this device, and remotely, family or the doctor, be constantly aware of the state of health in the context of this measurement. Already the technology when the Hoop mounted camera. We also use similar technology, but applied a new application of the camera in a smart wrap - smart-selfie, which will work with standing in front of the mirror. Also, the innovative component of this unit will be innovation, when smart Hoop will be built a few cameras that will allow you to produce circular shooting. These are the basic functions of this device. The rest of the disclosure functionality will be possible with the investment partnership or the full redemption of this idea. 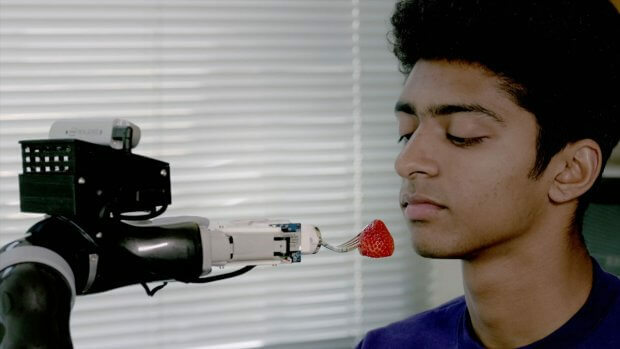 Engineers from the United States have developed a robot that will help people to eat, not able to cope with this daily action on their own. Attached directly to the wheelchair, the system recognizes the products on the plate, calculates how to take each of them so that it does not slip off the fork and the ward was comfortable to eat, and then brings the product to the user's mouth so that he can reach it with a flick of his head . According to a press release from the University of Washington citing data from the 2010 census, in the United States alone about a million adults need help with food. “The goal of the project is to give people a little more control over their lives,” the researchers explain. To teach the robot to take food from a plate, the authors of the development have previously wondered how healthy people eat. To do this, they provided the volunteers with a plate with more than a dozen different food samples and asked them to “feed” the dummy. Sensors embedded in the smart plug recorded the movements of the subjects. It turned out that people use a whole set of different strategies. So, if the product is very soft, such as a peeled banana, the volunteer stuck the fork at an angle so that the piece did not slip from it along the way to the mouth. If it was about hard carrots, the man deliberately shook the fork to stick it deeper without any extra effort. In addition, when a volunteer needed to pin a product with a thick skin and a soft inner part, like grapes or tomatoes, he first made considerable efforts to pierce the outer part, and then sharply reduced them when he reached the inner part. Thus, it turned out that the robot needs to adjust the angle and force of depression depending on the product it is dealing with. For this, the device was equipped with a special plug printed on a 3D printer. The degree of deformation of the gel in the sensor attached to it indicates to the system how solid a particular piece is, actually replacing the tactile sensations. However, the wisdom of the meal does not end there. It is important, after all, not only to bring food to the mouth, but also to take it so that it would be convenient for a person to eat it. For example, a small piece that fits in your mouth as a whole can be pierced in the middle. But a long carrot, from which it is supposed to bite off a piece, it is better to take it from one end and bring it to the mouth of the other. These subtleties also had to teach the system. The authors tested their offspring on volunteers who were supposed to feed the robot with different foods. The computer vision system recognized the food, and the roboruka stuck a fork into it and brought it to the subject's mouth. In general, the tests were successful.